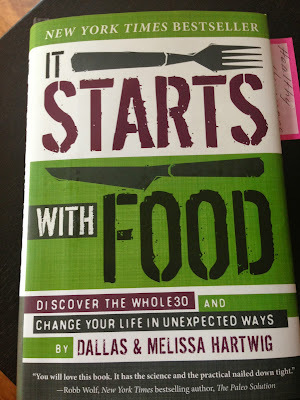 Over the course of the past few days, I've been reading the book "It Starts With Food". I can honestly tell you that've I've probably purchased a dozen nutrition and fitness books over the past decade. I have not finished a one of them! However, this book grabbed my attention. It was well written, lots of humor (sarcastic humor...my favorite) and incredibly informative. 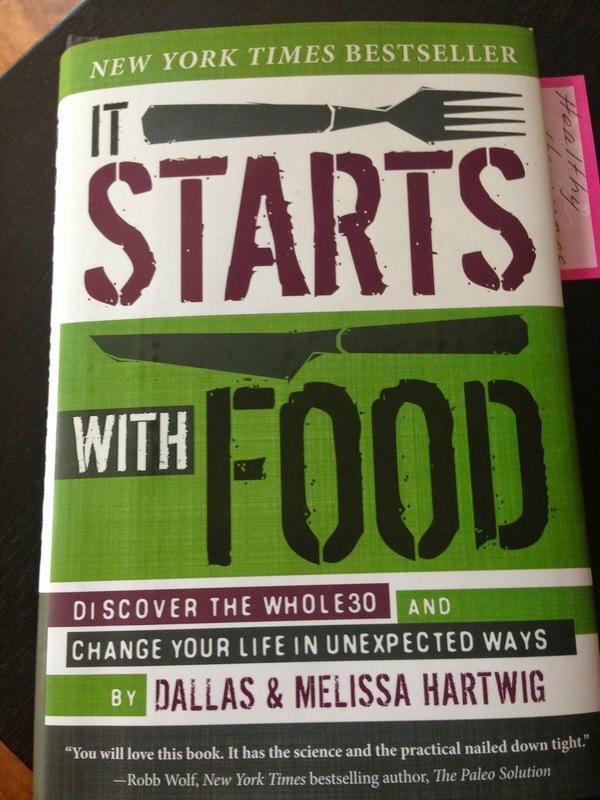 Dallas and Melissa Hartwig are the authors and the founders of Whole9 and the Whole30 Program. What they've written makes sense to me! Whole30 is nutrition based on Paleo rules: no alcohol, no legumes, no white potatoes, no grain, no dairy, and no sugar...no processed foods! Let me tell what I don't believe, not the reasons we've chosen to make this change. I do not believe that I have evolved from a cave woman. I believe in Biblical truth, 100%. I believe that there has been grain for as long as there has been human life. But I also believe that what is sold in our stores today is very different from what Abraham and Sarah used to make bread. I am not doing this as a weight loss program. While I think that there will probably be some weight loss, this is about overall health for my family and me. Now, let me share with you why we are choosing to follow the Whole30 rules. I am no longer a spring chicken! As much as I hate to admit it, there are major hormone changes happening in my body right now. I would like to regulate them with nutrition and exercise versus synthetic hormones. I am tired ALL OF THE TIME! Even when I'm exercising daily and eating "okay", I am tired! Once the caffeine wears off from my morning cup of coffee, I feel like I could go back to bed. My body is achy. If you know me at all, you know that I firmly believe in posture alignment, otherwise known as Egoscue. Even with all of the wonderful benefits of using Egoscue exercises, I am still achy. If I can relieve that by eliminating certain food products, then it will be worth it! My husband SNORES! Okay, hard to tell if that is more his reason or mine, right? We both want him to feel better and for both of us to be well-rested (without having to have separate bedrooms). Lately, and this one is SUPER embarrassing, I've noticed an increase in hair loss...not my husband's, MINE! As much as I hate to admit it, my appearance is pretty important to me. For crying out loud, my entire business is about making women feel beautiful. I am finding myself very self-conscious about this thinning hair. I've also been experiencing high amounts of anxiety. I honestly can't even tell you why. I am not worried about anything. But I feel anxious almost all of the time. My heart feels like it is beating harder but my heart rate is normal (yeah, I made my husband take my pulse). I've had issues with food cravings and/or addictions for most of my life. Going back to my first point, I am no longer a spring chicken. It is time to get this under control. So...today I will shop for things like canned coconut milk and ghee (or make my own clarified butter). Obviously, I will be shopping for a lot more than that. Those are just a couple of the new foods that are entering our menu. I can't even tell you how much I am looking forward to the next 30 days! I will weigh myself tomorrow morning and then remove the scale from my bathroom (or any other place that is easily accessible...I'm a scale junkee). I will not journal one meal or weigh one piece of food. That sounds like a lot of freedom to me! If you are someone that plays an integral part of my life, I would greatly appreciate your support. I'm not saying that I want all of my friends and family to give me "atta girls". I'm saying that I want you to keep any negativity to yourself. Bill and I believe that we are making an important change for our family and hope that either you will keep your negative opinions quiet or, better yet, see the benefit of this as well.